It's been a busy week here in Hossland. I really want to salute our raid team for the week thus far, as I feel that we have come a long way in a very short time since our first 25/normal raid in Siege of Ogrimmar just 3 weeks ago. 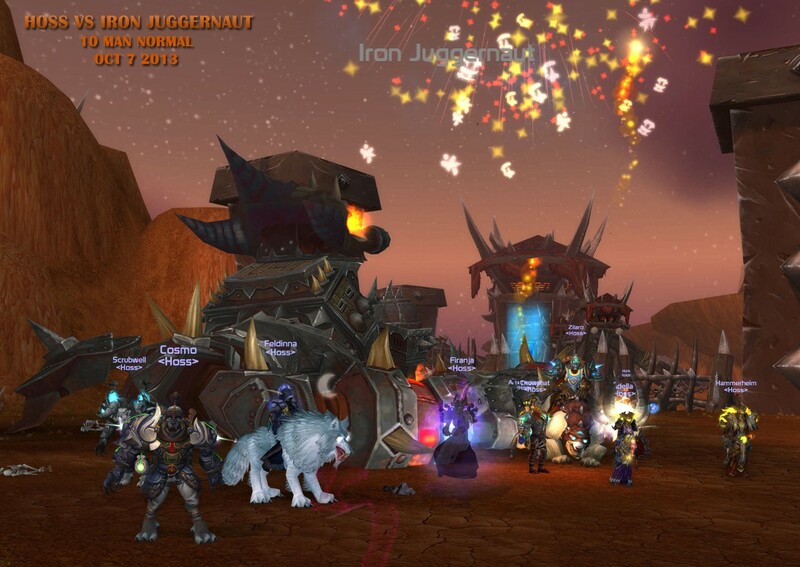 I set a small personal goal for our raid on Tuesday (which we met), by clearing through Iron Juggernaut on our first raid night (keeping in mind that we had yet to attempt Galakras in 25/normal), and that we met that goal with time to spare really started the week off right. Enter tonight, and I set another hopeful goal of simply getting 1 more boss killed. After several close attempts (even had them to 12% on our first try), the Dark Shaman fell soon after. As we pressed on toward General Nazgrim, I felt the night would be a great success if we managed to get *close* to winning after a few tries before our raid time ended. As we fought Nazgrim and his forces, everything just seemed to fall into place, and down he goes on our first attempt. 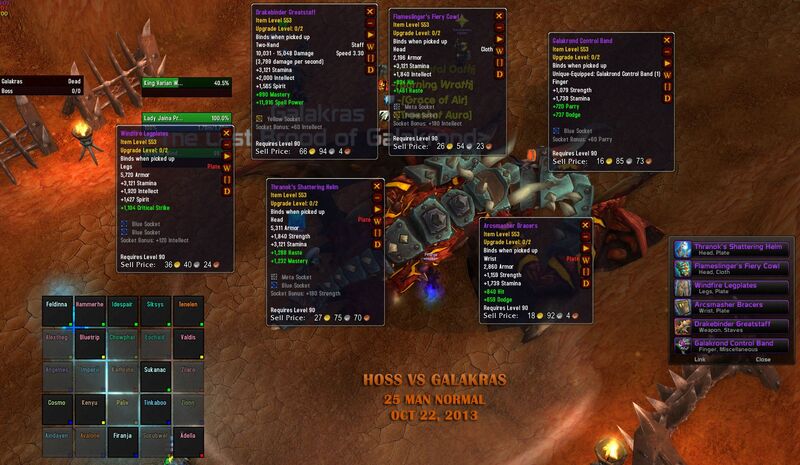 So as we complete the first half of the instance, I would really like to congratulate everyone on stepping things up and helping bring Hoss back a bit closer to where I feel we should be in status. Yes, it's only normal difficulty and we have 6 more bosses to go - but I finally feel that our raid has gotten it's legs back and can finally begin to run again. Here's some pics... hopefully more to follow tomorrow! Back to 25-man Raiding! Also RECRUITING! Since my last update, we've continued our progress through the Siege of Ogrimmar, and I am very happy to say that we have finally been able to get our 25-man raiding force together with some early success. 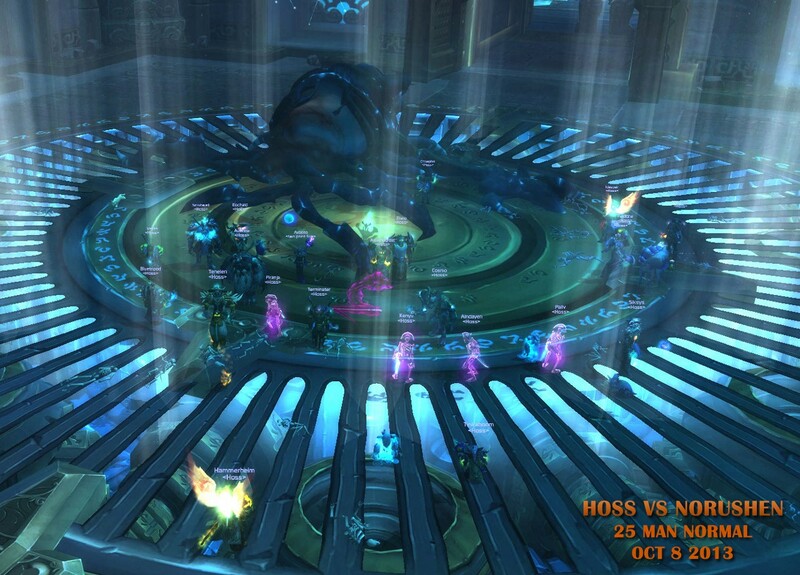 Our 25-man raid team has spent about 1.5 raid nights, and we have now downed the first 3 bosses. We are still actively recruiting for our 25-man raid, so please feel free to submit an application or contact one of our officers in game (Firanja, Tenelen, Valdis) - or ask a guild member in game if you don't see an officer online and they may be able to fine one of us on an alt. So last night was our 2nd night back at 25-man raiding and we managed to get the Norushen encounter cleared. We also currently collapse down and run 10-man later in the week to try and push further in general progress; this past week we killed both Galakras and Iron Juggernaut.